Growing up reading about the history of the Mediterranean and my love of Flamenco music, a visit to Spain has always been at the back of my mind. After our trip to Japan last year, we were longing to venture back into the open roads, and the remaining question was about where to go. After plenty of research and Nadiah’s mental prodding for me to go explore Europe, the idea of Spain came into the picture almost immediately! 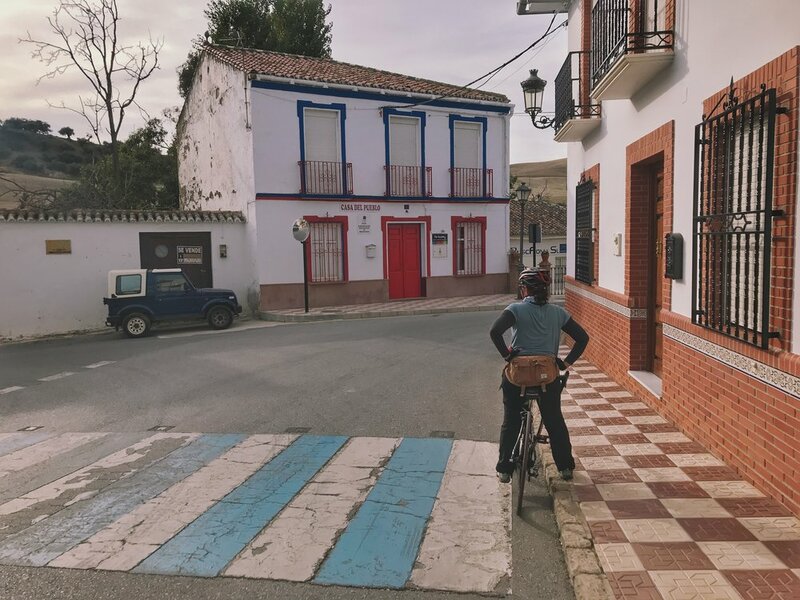 Not only do I get to visit the birthplace of Flamenco, but the idea of immersing ourselves in the culturally and historically rich setting of Andalucía while on a cycling tour piqued the senses. 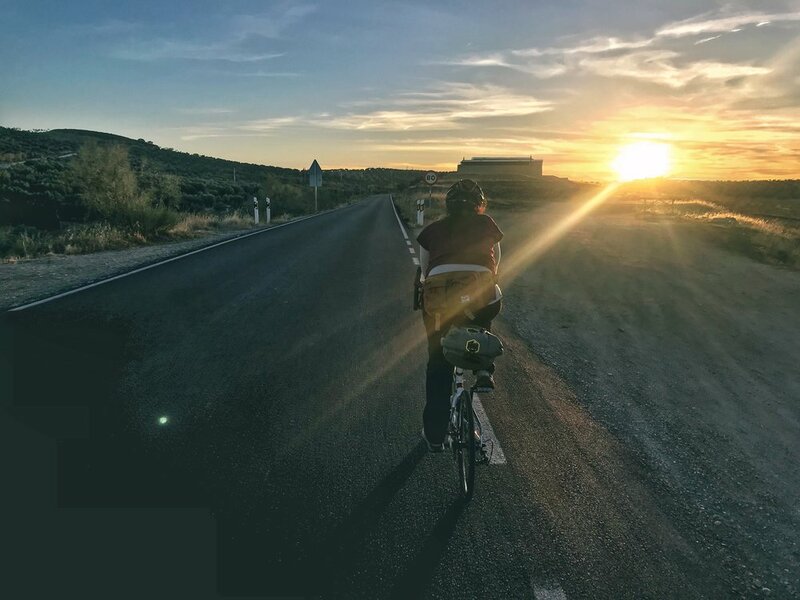 We made friends with the wonderful folks at Cycling Country (special thanks to Geoff and Maggi who are awesome) and they provided an excellent itinerary for us to explore the pueblo blancos of Al-Andalus – The White Villages of Andalucía. 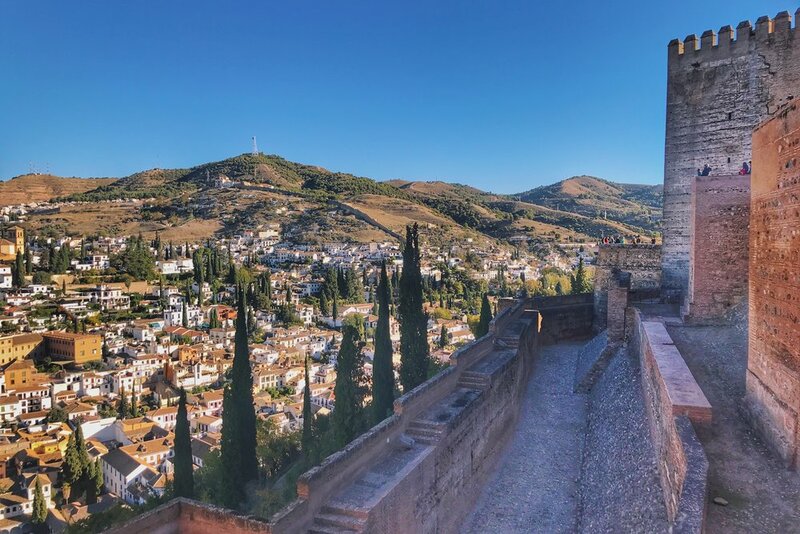 Our journey began in Granada, nestled at the foot of the Sierra Nevada mountains, and home to the Alhambra, the crown jewel of Spanish Andalucía antiquity. We explored the many beautiful views of old Granada from the Albaycin, and even had a little adventure into the Sierra Nevada. More on that in another blog post! The actual cycling tour was not lengthy in terms of days, but the amount of elevation we experienced was enough to give us an appreciation of the beautiful countryside. For this trip, I opted to go with the Change Bike with 700c wheels to cover the distances faster, and bigger wheels are also much better at overcoming long climbs. 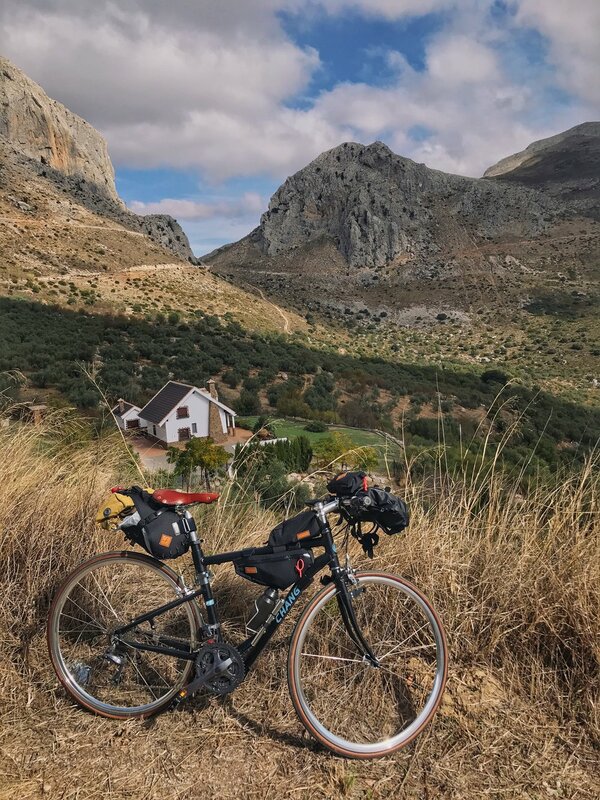 For this post, I'll straightaway begin with our cycling adventure into Andalucía. The first stage of our journey begins at the doorstep of Hotel Los Angeles in Granada. Our cycling tour started from Granada on the first day of November with amazing weather. We woke up to blue skies and a healthy dose of sunshine to keep us warm. Dean from Cycling Country greeted us at our hotel and made sure that we had all the information we needed to start our self guided tour. We had maps and cue sheets ready, and after a quick pressure check of our tyres, we were ready to roll! 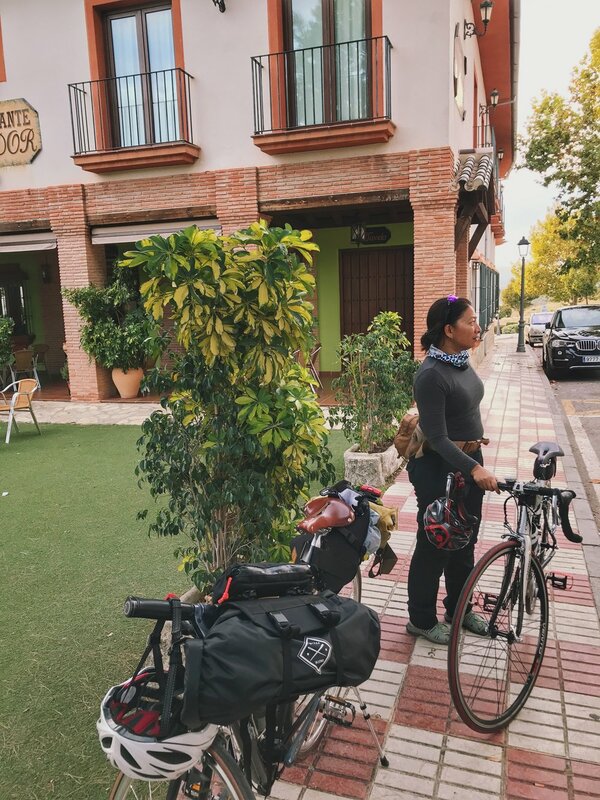 Out from the hotel, we made our way westwards, weaving between the smaller urban roads and footpaths until we found ourselves at the urban border of Granada. From there, we followed the bike path that runs alongside the Rio Genil as we ride out of Granada. At the end of the bike path, we continued onwards to small country roads and travel through the many small agricultural villages that make up the landscape of the Genil Valley. We passed through the small village of Vegas de Genil and stopped there for a late lunch right before the Spanish siesta. After an extremely pleasant lunch of calamari and pollo, we continued our travels along the quiet roads and admired the lush farmlands around us – olives, wheat and corn. There were plenty of rolling hills that gave us quite a workout as we continued with several slow and steady climbs. The only flat roads that we'd be riding on this tour were already behind us along the Rio Genil. From this point onwards, our travels would take us through many more rolling hills, and these hills became longer and steeper as the day progressed. We cycled past the villages of La Malaha and Escuzar and bid farewell to the Sierra Nevada mountains behind us. From this point onwards, the roads and landscape started getting more hilly and we found ourselves slowly transitioning to our climbing gears and keeping them there. 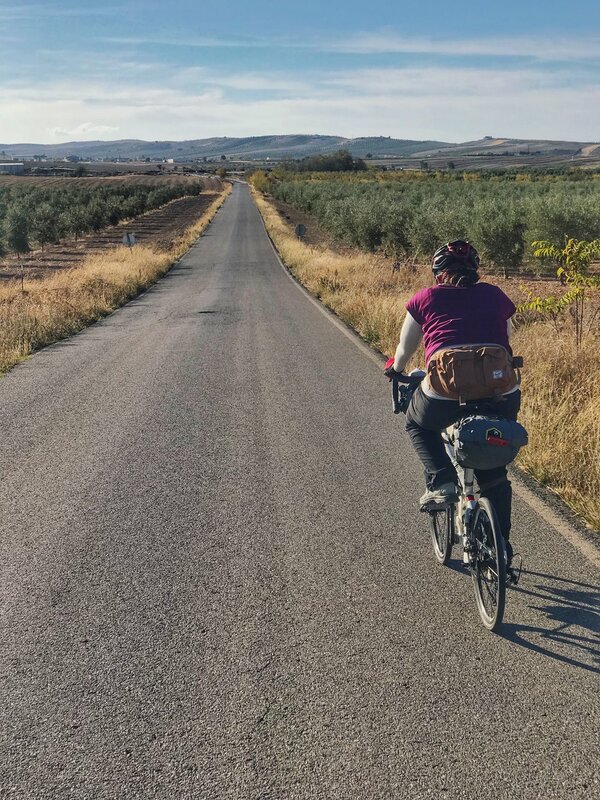 We traveled through many more small farming villages, and after riding through Ventas de Huelma, we continued again into the open countryside – and even more hills! The downhill parts were extremely enjoyable as we soaked in the scenery and the breeze, and of course this gave our legs a break before we mentally prepared ourselves for the next climb. We managed to catch the final rays of sunlight from the fading golden hour and tried our best to keep our pace while continuing onwards through many more hill climbs. With every view by every minute on the saddle, an Instagram cyclist could pretty much hashtag #roadslikethese and #lightbro for everything. The roads were so quiet and tranquil that you could hear the birds and animals – and Nadiah's breathing as she huffed and puffed on the next climb. As the sun dipped below the horizon, the temperature started to drop rapidly and my fingerless cycling gloves didn't cut it anymore. We arrived at the shores of Lake Bermajales right at the start of nightfall and stopped to enjoy the view, and to also protect our freezing hands with Merino wool liners. From the lake, we were able to see the beautiful coastal mountains – the Sierra de Almijara, Tejeda and Alhama. The bridge going through the Embalse de Los Bermejales would be the last temporary bit of flat riding that we'd experience for the evening. As we approached the end of the bridge and out of the lake, the sunlight had disappeared completely as darkness fell. The only lights we had were the ones on our bikes, and a tiny bit of moonlight illuminating the landscape around us. When we first continued into the farmland areas and left the lake behind us, it was nice and quiet and we thought it would be a very peaceful ride. Unfortunately, that tranquility did not last for long. The climbs only became steeper as we moved away from the lake. The coastal mountain range that we saw earlier from the shores of the lake should have served as a strong hint. Both mental and physical fatigue started to creep in, and I believe it was that combination that more or less gave our presence away to the many shepherd guard dogs patrolling the empty farmlands. Note to self: When cycling through farmland in Andalucía, it is best to finish the ride before nightfall. After sunset when everyone has gone home, only the shepherd guard dogs remain to protect the many miles of open farmland. Throwing bacon at them will not make them go away. We were easy prey. Two tired cyclists all alone in the dark, and Nadiah was already frightened and mentally fatigued, so she pretty much had a bullseye painted all over. I had to put in effort for bravado right when one of the bigger shepherd dogs came at me from behind and I had to exert a bit of the alpha status to keep them at bay. All this while climbing through ALL the rolling hills. The dogs continued to track and hunt while we continued to cycle as fast as we could through the hilly farmlands. Whenever we stopped to try to make an emergency phone call, we couldn’t get a signal, and we’d hear the tracker dogs catch up from behind us, so we had to keep moving. Adrenaline was pretty much the only thing that kept us moving! Right when we thought our legs couldn't keep going any longer, we felt the gradient of the road slope downwards and we were suddenly gaining speed! At last, we made it through the edge of the hills and enjoyed our victorious swooping descent and we could see the lights of Alhama up ahead – civilization at last! When we finally reached the base of the hill, we stopped nearby the old Roman bridge which served as the welcoming entrance into Alhama de Granada, and of course there was a hill climb on the other side into the village. At this point, Nadiah was exhausted beyond belief and we opted to ring up Cycling Country. Geoff came to the rescue and ferried us for the last 1 kilometer of the evening up into our lovely accommodation. We enjoyed a beautiful evening at La Seguiriya, a rustic and charming place with wonderful food and people. We opened our eyes the next morning and wished we could enjoy La Seguiriya for a bit longer, but the journey ahead of us beckoned and we wanted to make sure we finished before nightfall after last night's lesson. We had the terrace overlooking the valley below all to ourselves for the morning before we once again embarked on our tour. We stopped by Cycling Country's shop around the corner from La Seguiriya and met both Geoff and Maggi there. We had a good debrief session about the previous day's ride, and based on the distances and climbs that we'd be doing for the next few days, we all thought it'd be easier if Nadiah switched to 700c wheels. All the routes that we'd be doing are ideal for road cyclists with 700c wheels, but it would be a bit of a struggle for those riding 20-inch wheels to keep up. I was doing quite well so far with my Change folding bike as I've got 25mm tyres rolling on 700c wheels. At the shop, there just happened to be a beautiful Orbea carbon road bike that was the perfect size for Nadiah, so she opted to go with that steed for the remainder of our tour. From there, we get a short lift from Geoff in the Cycling Country van to skip past the initial steep hill climb out of the village. We then bid our farewells and began the second stage of our journey. 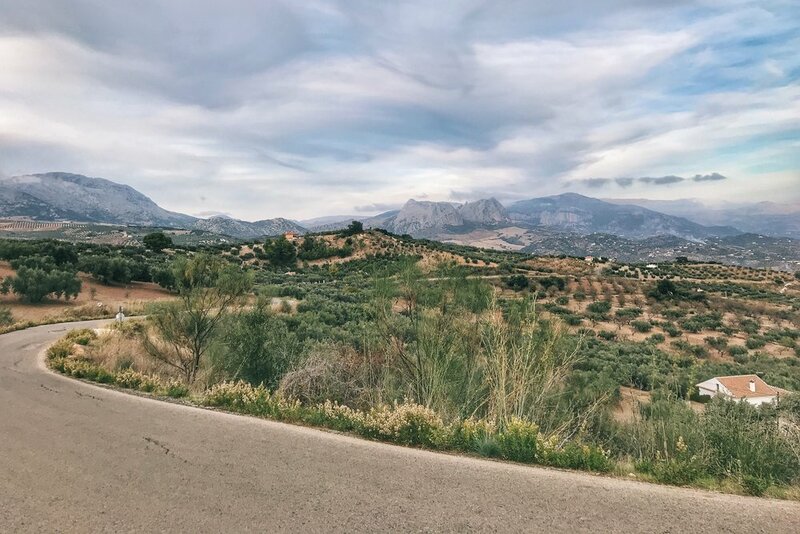 We had a blast riding down the winding descents of the Sierra de Alhama and arrived at the fertile plains of Zafarraya below. The Zafarraya plains are home to three villages, and the one that we cycled through was Ventas de Zafarraya. The Spanish "Ventas" refers to the small inns in the area, and back in the old days, this small village was where traders would often stay and refreshed themselves and their caravan before continuing on their journey. Beautiful limestone rock formations adorn the landscape surrounding the small village, and we felt a little bit like Frodo and Samwise from Lord of the Rings passing through a hidden passage amidst such epic and majestic mountains. At the edge of the village lies the Boquete rock formation, and was the first and last known place for European Neanderthal to have lived. In 1979, this area was recognized as the Cueva del Boquete de Zafarraya and it was here that the best preserved remains of a 30,000 year old Neanderthal was found in Western Europe. The natural break through this coastal range served as an important trade route during the Moorish Nasrid era in the 10th century where caravans were able to travel back and forth between North Africa and the Iberian peninsula. In fact, on a really clear day, it is possible to see the coastline of Northern Africa and the Straits of Gibraltar from this side of the mountain. In more recent history, this area was a strategic point where the Republicans fought the Nationalists for control during the Spanish Civil War in 1936. The coastline of Malaga was bombarded by Franco's troops and thousands were massacred along this coastal route from aerial and mortar attacks. In 1937, the exodus of Malaga saw 150,000 civilians escape to the east to Almeria. From Zafarraya, we head southwards into the Axarquia and ride through the natural parks of the Malaga mountains. 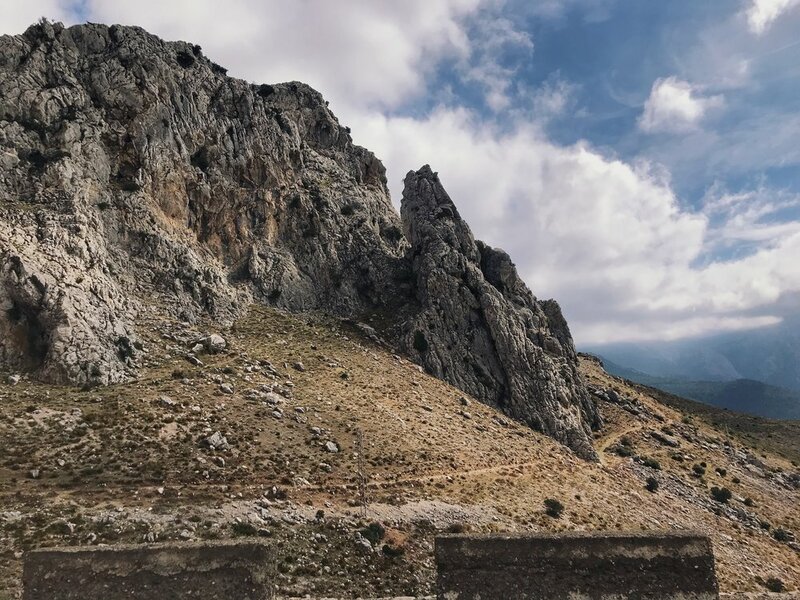 These mountains have also been witness to many battles and relentless bloodshed between the Muslim and Christian empires as both sides fought for control of Malaga in the 15th century. As the Christian monarchs won the final battles, the scales tipped in their favor and the Muslim armies were conquered, resulting in the fall of Granada in 1492. The days of battle and bloodshed have been long gone, and it is now a very tranquil region of farmlands and natural parks. Thankfully, today's route was mostly downhill as we spent the majority of yesterday climbing. 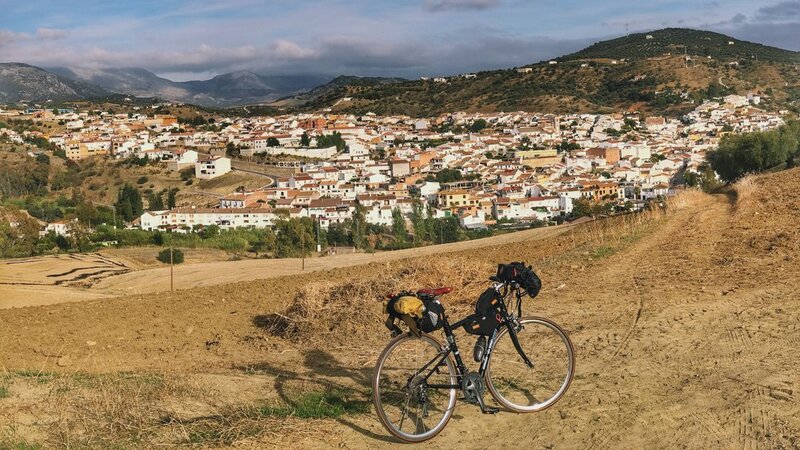 We enjoyed the fast and panoramic descents through the Axarquia and make a pitstop in the small village of Periana for lunch before continuing onwards through fields of wheat and barley before approaching the village of Rio Gordo. 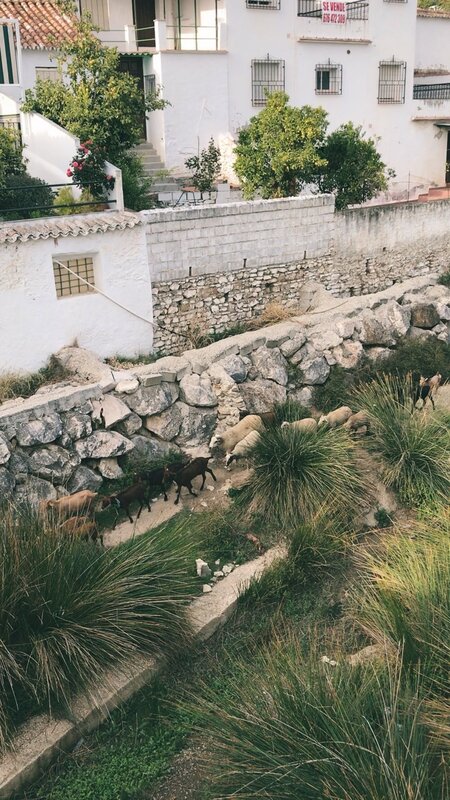 We enjoyed the tranquility of Rio Gordo as we cycled past the quaint pueblo blancos and witnessed a big herd of goats and sheep making their way through the small canal in the village. The residents of Rio Gordo enjoy the slow and plentiful life to the fullest extent, with an official "Snail Day" celebration dedicated to this lifestyle. As we kept going, we certainly felt like snails when climbing out of the valley from Rio Gordo. At this point, we've completed all the downhill parts of our journey and it is time to start our ascent again into the mountains. After climbing out of the valley through Rio Gordo, we at last make our way to our final destination of the day – Colmenar. Nestled within the surrounding mountain ranges that can be seen in the distance, Colmenar is known to the locals as the capital of the mountains! Colmenar is a small agricultural town that is also home to numerous beehives, its name derived from the word colmena which means beehive in Spanish. We made our final ascent and settled in a small family-run inn at the edge of town for the evening. And this time, we managed to make it right before sunset! Although we spent most of the day riding down beautiful descents, the final part of the day was spent climbing back up hills and mountains. 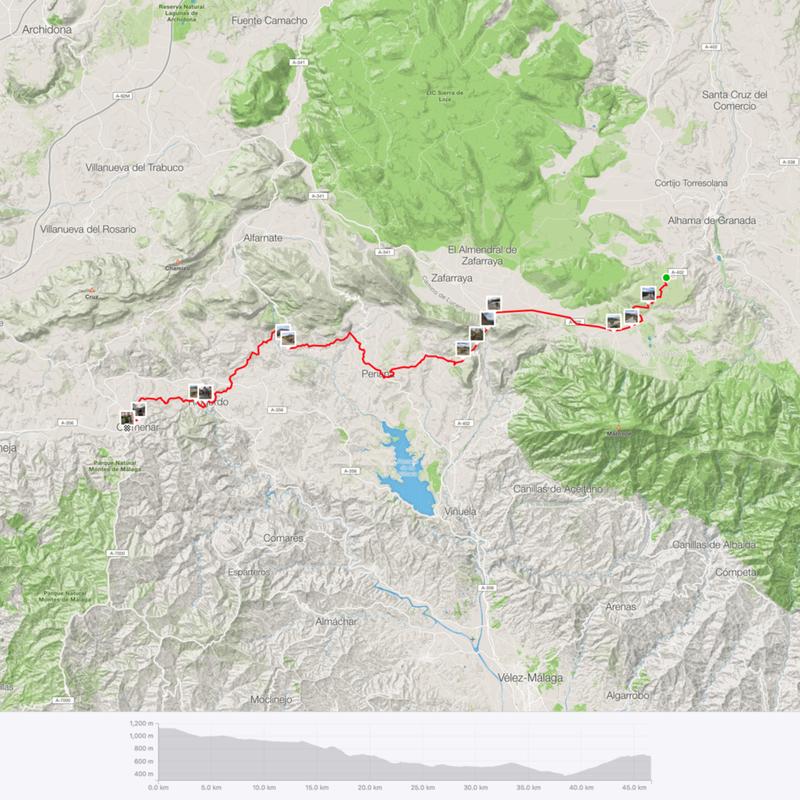 As for the next stage heading towards Antequera, this would be one of the most challenging rides to date. Continue reading the next part of the journey where I had to cycle solo for Stage 3!